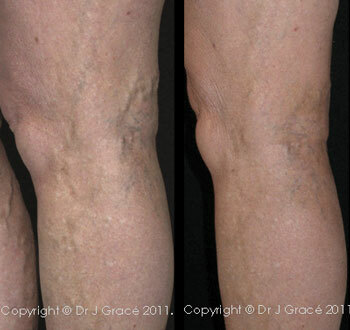 This 64 year old grandmother presented with an aching lower leg associated with a patch of surface veins. The patient received a single ultrasound-guided sclerotherapy treatment to the underlying abnormal veins followed by two micro-sclerotherapy treatment sessions to the surface veins. The patient was relieved of the pain completely and was very satisfied with the improved appearance. Underlying abnormal veins must be treated before attempting to treat surface veins. This patient should expect long term benefits and will probably not need further treatment in the future.